Every product you buy from us must be free of defects or you may return it immediately for credit or replacement. All B2C Jewels items are covered by a 1 year manufacturer’s Warranty that is valid in the US only, which covers defective parts experienced under normal wear and the labor required to repair them. We cannot warranty any stones that we did not furnish. Our warranty is valid only at B2C Jewels. Improper repair of warranty service performed by someone other than B2C Jewels will void this warranty. B2C Jewels disclaims any liability for consequential or accidental damages for breach of written or implied warranty of this item, including merchantability or fitness for a particular purpose. This warranty gives you specific legal rights, and you also have other rights, which vary from state to state. Some states do not allow the exclusion or limitation of incidental or consequential damages, so the above limitation will not apply to you. We offer a FREE, one-time re-sizing on any ring purchased on b2cjewels.com within thirty (30) days of the date on your purchase. 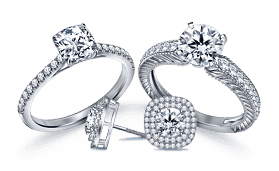 Re-sizing can only be done up to 1 size above or 1 size below the size of the original ring. For any re-sizing that is more than 1 size above or below the size of the original ring, please contact customer service. We reserve the right to refuse re-sizing of a ring if it is determined that the re-sizing will compromise the look of the ring. Any shipping charges incurred in sending the item(s) to us is the responsibility of the customer. Re-sizing will take approximately 7-10 business days. A full Eternity Ring cannot be re-sized because the stones are set all the way around the ring. However, B2C Jewels offers 30 Day risk-free shopping on all Eternity Rings. 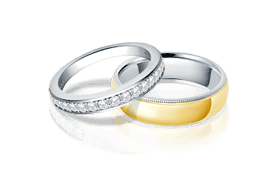 Eternity Rings purchased from us can be exchanged for a different size for up to 30 days from date of receipt. At B2C Jewels we continue to serve you long after you have purchased jewelry from us. We will replace a missing gemstone on certain jewelry for up to 6 months after purchase, FREE of charge. (Exclusion does apply here. See the section below on merchandise not covered under stone replacement). You are responsible for shipping charges when sending the item to be repaired. General wear and tear such as scratches, dents, nicks or missing stones. Although our jewelry is resistant to moisture, water damage is not covered. Fading/chipping of the material on the product (which depends almost entirely on how you handle the product). Damage due to personal misuse or negligence. Damage, accidental or otherwise, to the item while in the possession of a consumer not caused by a defect in material or workmanship. Damage caused by consumer misuse, tampering with or failure to follow the care and special handling provisions in the Instructions. Damage to the finish of the case, crystal, bracelet, strap or other appearance parts caused by wear. 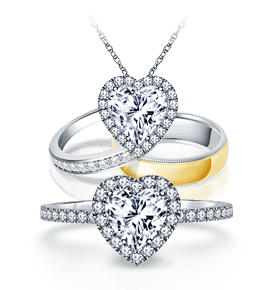 This warranty also excludes any jewelry merchandise that has lost a single stone with a total carat weight of 0.12 Carat or larger. Please see Care Instructions that offer valuable information, provided by B2C Jewels on how to prevent and protect your precious and semi-precious stone from becoming loose or falling out. You must email warranty@b2cjewels.com and notify us that you will be shipping your merchandise. You must include your Name, Order Number and Item Number with the word “Repair” in the body of the email. Make no reference to the contents of the box that you are sending. You must include a copy of your invoice along with the item you wish to have repaired. Insure your package against damages and/or theft. You are liable if you fail to ensure your package being returned, exchanged or repaired and it becomes lost or damaged. Insurance costs involved in the prevention of the same are very minimal. Insure your item for the total amount you paid when you purchased the item. You are responsible for shipping charges on returns and exchanges. Use a shipping carrier that has a tracking receipt and provides insurance against the item.